Over the past few weeks, reports have trickled in to Herdict and via Twitter, alerting us of the filtering of individual Twitter pages in Tunisia and Bahrain (as well as, possibly, China). In Tunisia, the accounts of exiled activist Sami Ben Gharbia (@ifikra), engineer @Ma7moud, and popular independent news source Nawaat (@nawaat) have been confirmed inaccessible, while in Bahrain @FreeBahrain was allegedly blocked on New Years Day. Twitter is no stranger to being blocked: Both China and Iran have blocked the social networking/microblogging site in the past, and Saudi Arabia reportedly blocked two individual Twitter users pages in mid-2009. 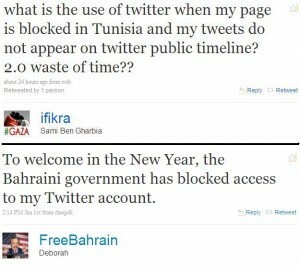 Be the first to comment on "Tunisia and Bahrain Block Individual Twitter Pages"